Every month, the facilitators at both our older and younger campuses gather for an informal meeting where we check-in with each other. The goal is help us feel connected as one campus even though we are apart and to share facilitation stories so we can support one another. Yesterday we loosely followed a “Rose, Bud, Thorn” format that some of our branches kids enjoy doing. The rose is something wonderful we are celebrating or happy about, the bud is something we are excited about happening in the future, and the thorn is a challenge we are experiencing. I didn’t get a chance to share then due to lack of time, so I thought I’d simply share my current Rose, Bud, and Thorn here in this blog post! We’ve changed how we do change up, and it’s increased the ability of students to participate. We go through the items on our Community Mastery Board as efficiently as we can. If there is a topic or awareness that feels like it needs some creative problem solving, we pull it aside as a “focus topic.” We try to limit this to 4 focus topics, and one of those topics is usually a wish a kid or adult has made for the school. The kids work in small groups to discuss a hot topic for 10 minutes and then present a solution for the school to try out for the next week. One example of this is when small group worked on granting a wish about building connection among students. The kids in this group decided that scheduling two group games a week with everyone participating is a fun way to do this! We’ve been practicing this for two weeks now and I’m excited to continue this practice as long as the kids are too. There are kids who are contributing to the culture creation at our school through these small groups that were not speaking up before when we did our Change-Up meetings as a whole group. Even though each kid isn’t a part of creating each solution, the buy-in to adhere to proposed solutions feels much higher because the kids understand how much thought it takes to come up with a potential solution. I am loving that this feels like true co-creation of the culture with kids. @tomis blogged much more deeply about this Change Up “change-up” here. Two of our parents, Kristine & Melissa, have become more involved at school this year and it has been really fun to have them at school! They have been making meaningful relationships with the kids and sharing neat and unique offerings. Melissa likes to do various crafts with the kids and take them to the library. I really enjoyed making life-sized paper versions of ourselves with her and the kids. She also brought singing songs together to our space this week, which I loved joining! 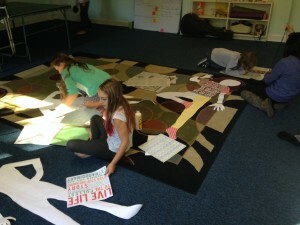 Making life-sized versions of ourselves. Kristine is an avid member of the girl scout troop with her daughter and is bringing neat activities to share from her experiences there. She introduced Biztown to the kids (a program run through Junior Achievement) and the kids are learning about financial literacy and how adults make, spend, and manage their money. This includes “playing” adult as they set up mock-checking accounts and apply for jobs that they will play out in the Biztown city in Uptown, Charlotte. You can watch more about Biztown below. The kids used all their left over money from last year and the money they made in the summer to hire Amy Steinberg to lead theater classes with them. The dedication they have to this 2 hour weekly class is really cool to see, as well as Amy’s direct and clear leadership of the class. While yes, we are unschoolers at heart and the kids lead their own paths, they have chosen to hire this person to instruct them. Amy has boundaries she sets around how to participate and makes those known and has expectations for the kids to meet. And they love it! They have learned some really cool games that help improve their focus, concentration and work on spacial awareness as they learn about stage directions. What I’ve learned from seeing this is that I’d like to see the kids have more of the supply/facilitation budget to choose the classes and teachers they have at school so they 1) take complete ownership over what they get out of the experience and 2) are invested and committed to what they bring in. I mentioned the library trips becoming a regular thing, but we also have fun book/movie club that @Jesslm started up and the kids are really into it. What’s interesting is that I see other books brought in the space in addition to the group reading. The kids are sitting and reading other books too at school, and they also know that each week they have the opportunity to get more books at the library. What’s been fun is that I think the shared reading experience through the book/movie club has normalized the hearing of stories regularly in the space and the kids are just enjoying that and creating more experiences to engage with stories on their own outside of this as well. While it is sometimes hard to simply enter the school due to tripping over bikes, I ultimately love that the kids love biking here. They learn how to bike safely and share the road with cars. They also get to go to the Recyclery weekly if they want with @Charlotte to learn about bike care and maintenance. The kids who practice are pretty damn good. They love it. I’ve been impressed with their eye-hand coordination! We have @dthomasson to thank for sharing his love for table tennis with the kids! They model how it takes practice, and a lot of practice, to get good at a skill. Having a rotating interest station at school: We set up a display with rocks in the hallway as a test to see if kids would notice or engage with a random interest station if they were bored. It was put up and we didn’t actually notice much engagement with it. At Change Up we thanked the kids for not losing any of the rocks and respecting the station, followed with the announcement that we’d take it down. After hearing this, one of the kids raised their hands and said, “I really liked having all the stuff about rocks out there because sometimes if I was bored I’d just go over there and look at them and read about the different kinds of rocks.” This led to the kids wanting to have a focus group talk about having an interest station stay at school. The outcome was that the kids wanted to have input on different topics this station could have information about, and that they wanted it to change regularly. Some of the interests they proposed were to have the table set up with math activities, nature activities, stuff about bugs and snakes, or stuff about clay and pottery. They group took a vote from the whole school and it was decided we’d start with bugs and snakes and then work through the other interests. A small group worked this week on a wish to help everyone feel welcomed at school. A student felt really passionate about having a visual board in place where people could move their names to visually show how they are feeling to others. He explained that if someone was feeling lonely, they could move their name to show this and then others could know to check-in with that person. I loved this idea, especially coming from a student who is in touch with his feelings and feels it important for others to respect each other and their feelings. This student also advocated for feelings check-ins at Spawn Points because they felt it would help people open up and share with each other more. The kids now all are in the daily practice of doing this, and at our last Change-up meeting, excitedly supported continuing this practice daily. The kids have come up with a new way to track where kids are, and since they came up with this, it’s more likely they will honor it. We had a velcro system we used last year, but it’s not reliable. We need a better way to see who went out biking with Charlotte or to the library with Melissa, etc. Sometimes you are looking for someone at school but they are actually doing something off-site and we want to easily be able to see this. So we are going to hang white boards by the exit door and the request from kids was that adults taking kids off-site need to put who is off-site, and where, on the board. Some kids have been asking to do math at school. Kristine brought in a bunch of Math-U-See stuff she used while homeschooling and met with me and Melissa to talk about offering math to the kids at school. I LOVE math because I love problem solving using logic and creativity. So it was exciting to meet with them – and the kids knew we were meeting and were curious and asking when math would start. We decided to offer three different types of math classes – one with games geared towards younger kids, one with the goal of becoming more fluent with multiplication tables (because it really does help you calculate faster – this IS a useful math skill to gain), and one for Algebra because the older kids have specifically asked for that. We’d offer these all at the same time so that there was a larger critical mass of kids engaged and the school would be quieter. The kids were then presented the choices and signed up. Again, this is just for the kids who have been asking for it and wanting it! I do not believe that math class is a “should” thing. It’s just one type of offering that can be fun, and the kids not wanting to do it are not (at least from me) given the message that they are missing out on anything, because I don’t believe that they are missing out (this article shares some great benefits of NOT receiving direct math instruction). For me, [math instruction] is not about teaching anything! I’ve taught math to very young children all the way through teaching math to prepare highschool students for college entrance exams (Alg 2, Trig, a little pre-cal). I actually don’t remember anything from those upper level classes. I always loved math, and I retain very little memory for formulas. What I retain is a love for solving problems, so every time I teach upper level math, I relearn EVERYTHING with the students. So in essence, I’m rarely teaching anything, but learning with. I take that with me when I work with younger kids, seeing everything as fun problems to solve. It’s fun to solve problems and to think logically and creatively!! Basically, the point of learning math in school to me isn’t about learning math, it’s about learning how to think both logically & creatively. When kids view the math education and getting the right answer over the process of learning how to think creatively and logically, that’s when kids start to compete and think of others in terms of “smarter” or “better” than other people. Kids CAN be successful in the world without knowing algebra. But what is a trait that is important for success, I believe, is to be able to solve problems and to do so creatively: innovative thinking and new ideas require creativity and out of the box thinking. Some the kids are doing this when they are playing minecraft, dramatic play, etc. And some of the kids will be doing this as they learn math with us!! What will the kids bring in next? The kids have already started talking about hiring Amy back in the spring because they like theater so much. I’m also excited to see who/what they decide to bring in next with their finance kids budget. They enjoyed having Mary B here last year for yoga, and some kids would like to see her come back. A bud for me here is to see what they decide to do next, and then next after that! 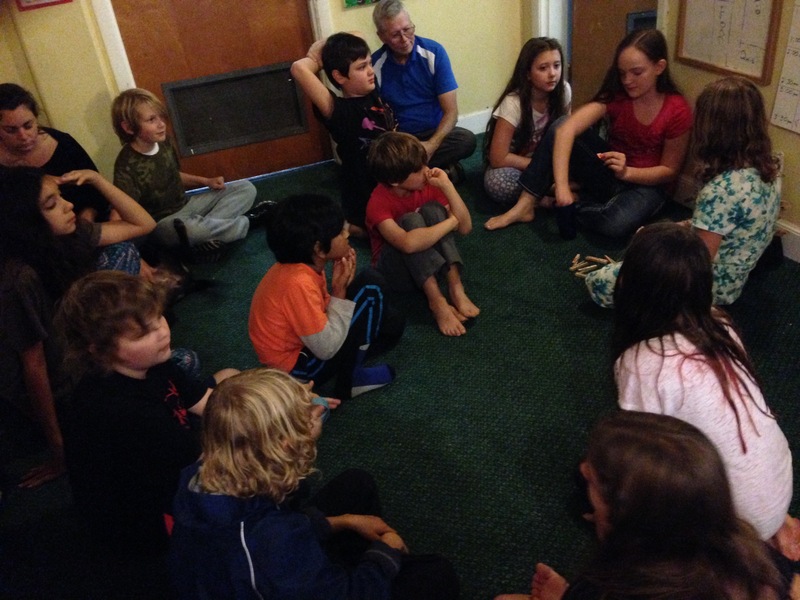 @Charlotte has had some really inspiring environmental talks with kids that are spreading in the space. She and a small group of kids have decided to try to make some small changes in their lives that they hope will make an environmental impact. Charlotte also met a family who only takes out 3 bags of trash a year because they have limited how much waste they make as a family so efficiently. When she told the kids this at set-the-week meeting, and then told them that this family would love to share with us how they live this way. The kids were so excited! She asked for a show of hands of who would be interested in meeting the family and almost every hand shot up. I want to have one campus. I also want the parents to have ease coming to school. I want to have more animals at school and outdoor play structures. It’s hard for me to justify putting money into developing our current outdoor area since I know ultimately that many parents would like to see the school move to a different location. I also love the space we are in and want to see a school stay there, and have considered the possibility of always having an ALC run there even if we find another location. I support the idea of many small schools happening – small schools that have relationships with other small schools so the kids can visit and mix with each other, while still have the deep relationships that come with smaller communities. Well, I just think the school days are too short. I kind of wish we were a boarding school where we didn’t have to stop at the end of the school day. I can see how this is different from at home “unschooling” where if you get into something at home, you can just stay with it until 8pm if you want. We stop at 3 for clean up and an end of day ritual, and sometimes that means we just have to stop the cool thing we are doing and then have to get re-engaged the next day or after we are at home. This part is tricky because there are times you just really want to stay doing the thing you were doing!